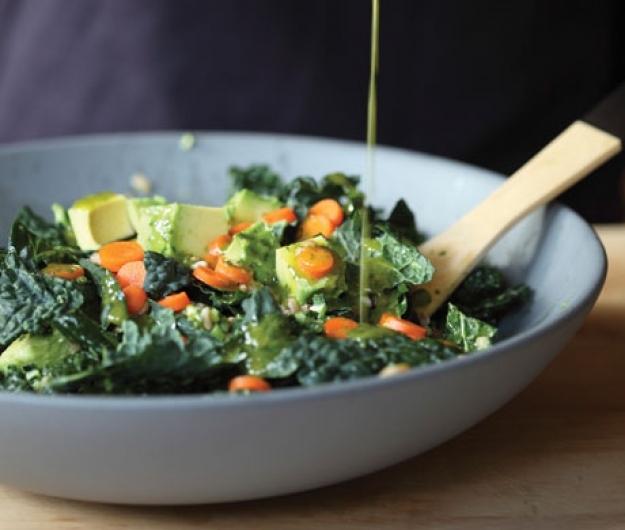 To make the dressing, place all of the dressing ingredients in a blender or food processor and blend until smooth, or use an immersion blender to blend all the ingredients in a bowl. To make the salad, bring a small pot of salted water to a boil. Add the farro and cook until tender, 16 to 18 minutes. Drain, rinse with cold water until cool, then drain well. Remove the stems from the kale. Cut away any tough ends, then finely slice the stems and tear the kale leaves into small bite-size pieces. Place both the stems and leaves in a large salad bowl. To remove stems from chard or kale, start by trimming the stem ends. Then hold a leaf by the stem in one hand and use the other hand to tear the leaves from the stem into bite-size pieces. To make cleaner-looking stems, use a knife to cut the leaves from the stem on both sides in a pointy triangle. Add the avocados, carrots, and farro. Add half of the dressing and toss to combine. Add more dressing if desired.